The Conservative peer, who was 68, served as an MP for both East Angus and South Angus. Lord Fraser of Carmyllie, a former Lord Advocate who led the investigation into the Lockerbie bombing and headed a public inquiry into the Scottish Parliament building project, has died suddenly. 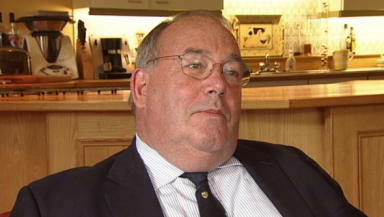 Peter Fraser was a Conservative MP for Angus. He served as Solicitor General and Lord Advocate under Margaret Thatcher. Lady Fiona, wife of the Conservative peer, said: "All of my family are with me in Carmyllie and we are completely devastated by Peter's sudden and unexpected death. "On Friday we were making arrangements and filling our diaries with plans for holidays, the Open golf championship, visits to family and friends and the Christening of our latest granddaughter Delphin and the next morning he was gone." The Lord Advocate Frank Mulholland QC paid his respects on Sunday afternoon, saying: “Lord Fraser will be missed in the prosecution service and more widely in the legal profession. He served with great distinction as both Solicitor General for Scotland and Lord Advocate. "I first got to know him in the Crown Office which was then situated in the Royal High school. He gave willingly of his time and was admired by all who worked for him. He never shied away from taking difficult decisions even if they were controversial or would lead to criticism and this was widely admired. Scottish Conservative leader Ruth Davidson paid tribute to the 68-year-old. She said: “Peter brought a formidable intellect to both Parliament and Government. He loved Angus – the area he represented as an MP for so many years, and where he continued to live until his sudden death. First Minister Alex Salmond said: “Lord Fraser leaves an outstanding record of public service to Scotland as a politician and, particularly, as Lord Advocate. More recently, he readily agreed to serve as an independent adviser to the Scottish Government on the Ministerial Code — another public service he performed without fear, favour or any remuneration. A funeral service for Lord Fraser's extended family is being organised with a public thanksgiving service to be arranged in a few weeks. Lord Fraser was educated at the prestigious Loretto School in Musselburgh, his tuition funded by a scholarship. He studied law at Cambridge and Edinburgh and was admitted to the Faculty of Advocates in 1969. He was elected MP in 1979, representing South Angus and later East Angus. He served as Parliamentary Private Secretary to George Younger, then Secretary of State for Scotland, and took silk in 1982. That year, Margaret Thatcher appointed him Solicitor General for Scotland and later Lord Advocate. He was made a life peer, styled Baron Fraser of Carmyllie, of Carmyllie in the District of Angus. He led the investigation into the Lockerbie terrorist attack in 1988 and served as a Scotland Officer minister from 1992 until 1995. In 2003, he was tasked with probing the Scottish Parliament building project, which ran over time and budget.